With the pressing need to find carbon-free sources of electricity to address climate change, some environmental groups that once opposed nuclear power now see it as essential. While policymakers have dismissed nuclear facilities for safety reasons, the new calculus is that the risk from nuclear power plants is far smaller than generally perceived. Policymakers who write-off nuclear as being too dangerous are doing a major disservice to the public by warding off a safe, effective carbon-free technology. Severe nuclear accidents are rare and extremely unlikely to cause any near-term off-site radiation fatalities or radiation sicknesses. A review of four major nuclear power plant accidents—the fire at Browns Ferry plant, the Three Mile Island accident, the Fukushima accident, and the Chernobyl accident—confirms that no off-site, near-term fatalities or radiation sicknesses occurred. In Chernobyl, the worst nuclear power plant accident in history, there were cases of thyroid cancers in children who consumed radioactive, iodine-contaminated milk from the surrounding area. This would not happen in the United States because there is a food interdiction plan as part of the overall emergency response plan, which includes a 50 mile zone around each nuclear plant to deal with preventing the ingestion of contaminated food stuffs, should there be a release of radioactive material into the environment. Even if hit by a weather disaster or act of terrorism, nuclear power plants do not pose a significant threat to society. Sandia National Laboratories performed studies where scenarios revealed that in these cases, even if all active safety equipment failed and no protective actions were taken by plant personnel, nuclear accidents release far less radioactive material into the environment than previously thought. When this radioactive material is released, it enters the environment much later and more gradually than thought before. While it is very unlikely that all safety equipment would fail, the scenarios prove that even if they did, the radioactive material would not represent a serious threat to public safety. Nuclear energy is safe, clean, and ripe for innovation. If policymakers continue to leave it out of the carbon-free equation, they will make it far more difficult to address climate change. 1) What role should nuclear play in a carbon-free U.S. energy future? 2) Will lower utilization of nuclear hurt long-term decarbonization goals? 3) Are potential risks of nuclear power outweighed by the possible impacts of climate change? Nuclear power plants today are probably 100~1000 times safer than a coal power plant using about any safety metric you can come up with (deaths per MWh, etc. – but see #4 below). 1. Nuclear is expensive. For a given amount of money (say, $10 billion), you can build a lot more megawatts of wind and solar than you can nuclear. Storage is not needed for all renewables power (demand response, long-distance transmissions lines, dispatchable renewables, etc. can be used in place of storage) but even with storage, renewables will be cheaper than nuclear in the timeframe of deploying a new nuclear plant. 2. Nuclear takes a long time to deploy. Climate change depends on the cumulative emissions of CO2 and other greenhouse gases. In the time it takes to deploy a nuclear plant (a decade or more), renewables could be implemented much sooner (about a year) and they would reduce cumulative emissions far more. 3. People have an irrational fear of nuclear power. While it may be irrational, it is still real, so policymakers will not support nuclear until public perceptions change… and that is not going to happen anytime soon. 4. Nuclear plants are dangerous if not decommissioned properly with the spent fuel sequestered underground. While it may be true that enough money is set aside to decommission a nuclear plant and (someday) sequester the spent fuel underground, this assumes we have a functioning and capable government in place at the end of the plant’s life. Unfortunately, because of climate change, this is no longer a safe assumption. According to climate scientist Kevin Anderson, a +4ºC warming “is not compatible with an organized global community.” We may likely be way past +3ºC warming at the end of a nuclear plant’s typical 40-year life. Solar and wind are much more benign if abandoned. So while nuclear is much safer than coal (and natural gas) and is emissions free, it is too costly and slow-to-deploy compared to renewables. It is also dangerous to deploy given the possible state of society at the end of the nuclear plant’s life (due to past and present use of coal and natural gas!). Dan: I know that you are very concerned about climate change, as you should be, and whether or not we are reducing GHG releases fast enough. It must be particularly vexing for you when you read that GHG releases in recent years have increased, not decreased. Therefore I consider you a prime candidate for becoming an ardent supporter of nuclear power, but first we have to purge a number of misunderstandings that I think are holding you back. Let me start by sharing some concerns that I have about climate change. Not only is climate change an existential threat to all living things on this planet, there appears to be significant uncertainties in how soon we will feel its most severe effects and the magnitude of these effects. It must be disquieting to you to hear that the environmental damage that once was predicted to be decades away is now happening much sooner. For example, hurricane Harvey that not only was a huge hurricane, it inundated Houston because the water in the Gulf of Mexico was so warm right up to the shoreline, Harvey did not become less dangerous as it approached land as many hurricanes have in past years. This supports fears that some climate scientists have about increasing severity as well as increasing category 4 and 5 frequency. For me, another major concern is polar vortexes that bring exceeding low temperatures. These vortexes appear to be caused by jet streams that circle the Arctic, but their former largely circular patterns may be becoming less stable due to climate change, resulting in extreme cold reaching further down into the States more frequently than in the past. Instead of being mostly concerned about high peak temperatures in the summer, it is possible that climate change will result in both peak heat and peak cold conditions. Unfortunately, this does not bode well for the solar energy contribution which is at its minimum during the winter, and the panels themselves may be covered by snow more days out of the year, even when the weaker winter sun is shining. Incidentally, decreasing solar energy output because of polar vortexes is not a major concern for NY State. Solar energy has been touted in New York since Governor Pataki was in office. The reality is that last year solar energy in New York would only be enough to run the whole state for about 3 hours and 12 minutes, far less than one percent of the time. I’m also concerned about category 4 and 5 hurricanes which may become more frequent because of climate change. Perhaps you have read about Category 5 hurricane Maria that tore apart the Punta Lima wind farm in Puerto Rico or the category 4 hurricane that did great damage to the wind farm on Miyakojima Island in Japan. Other weather events to keep in mind include the tornado that hit California’s Desert Sunlight Solar Farm in April, 2015 causing the loss of nearly 170,000 solar panels. The plants was not completely repaired for eight months. The fundamental physics of the situation is that the energy density of solar energy is low, like the number of watts collected in a solar panel per square meter, over a year’s time. Because the energy density is low you need large collection areas to gather enough energy and “hardening” these large collection areas to withstand the detriments of nature can be very expensive. To put this into perspective, in order to match the output of the two Indian Point nuclear plants, which are sited on 0.40 square miles, with NY onshore wind turbines would require about 682 square miles, based on actual land measurements in New York made by the National Renewable Energy Laboratory. Those systems that are exposed to the benefits of nature,like collecting wind and solar energy, are inherently exposed to the detriments of nature. By contrast, the radiation from nuclear power plants would be very dangerous to the public if it were not for the very robust containment buildings that surround the reactor vessel. These buildings have proven their strength by maintaining safe conditions even under extreme natural conditions such as being struck by a category 5 hurricane, being hit by tornadoes, floods, even the magnitude 9 earthquake in Japan where none of the 50+ nuclear containment buildings failed from the earthquake. The inherent safety characteristics of USA nuclear plants makes them largely immune to extreme weather events. When all of this is put together it appears that nuclear facilities have already proven that they can withstand the extremes of weather that climate change scientists predict more readily than many renewable energy systems. NY is planning to build “The world’s largest wind farm” off the south shore of Long Island. As far as I can tell, it will only be designed to handle a category 3 hurricane. Just image what would have happened to this oversized wind farm if it had been in place when superstorm Sandy, a category 5 hurricane, came plowing through the same off-shore area now planned for this wind farm. The bottom line is this: we need all practical sources of electricity + lots of conservation. If you study the amount of electricity we will need if we are to eliminate GHG releases from the end use sectors it is tremendous. The issue is not whether renewable energy is better than nuclear or vice-versa, but rather can be deploy enough electricity quickly enough with renewable + nuclear to reduce GHG emissions at the rate we must do deal with climate change. We only have a few tools in out climate change tool box. It is more than foolhardy to discard any tool, especially the one that produces the largest amount of carbon-free electricity in the nation. This is an argument for having a mix of electricity sources to have greater assurance that our supplies will be sufficient. There also is an argument for having a mix of energy sources because we need a diversity of energy sources. Mother nature teaches us that diversity is a basic survival strategy.Therefore, as a first step towards becoming an ardent supporter on nuclear power you would have to retire this worn out idea of choosing between these two sources of clean electricity. Clearly, nuclear + renewable reduces GHG releases more rapidly than either one alone. Responses to you other comments will follow separately. Herschel: I’m all-in with you on the dangers of climate change. And except for my more recent concern about #4 above, I’m not against nuclear power. It’s generally safe compared to fossil fuel energy and its carbon free. In an ideal world where we are planning a World War 2-style effort to fight climate change, large-scale nuclear would have a place. But we are still fighting this war with quite limited resources. So if you gave me $10B and told me to reduce emissions, I would not put it towards nuclear. Wind and solar (with some storage) will give us much more bang for the buck because they are both cheaper and faster. Yes, natural disasters can wreck wind and solar, but they can also wreck the distribution lines (as we saw in Puerto Rico) so distributed power generation has its merits too. While I hope that small, safe, and economical nuclear reactors will become commercial in the near future, there are other “baseload” energy technologies that can be developed and deployed in the timeframe of a nuclear plant development including low-temperature geothermal and “geothermal anywhere” (deep drilling technology) as well as all the new storage technologies, demand response, dispatchable renewables, etc. With regard to nuclear power being expensive, I partially agree with you. However, both you and I have argued that the cost of actions we take today to reduce the impact of climate change is very small compared to the cost of not taking these preventative and mitigating actions. There are very large opportunities to reduce nuclear power plant costs. Before discussing ways to reduce the cost of nuclear power, we need to use consistent assumptions and analyses to make meaningful cost comparisons. Perhaps the best metric to compare costs is to use the LCOE, the lifetime cost of energy, but do this analysis over the whole fuel cycle from mining operations, through manufacture, through installation and maintenance, to operating lifetimes and eventually to decommissioning and waste disposal. One would have to account for all the federal and state subsidies, including federal subsidies in research and development. One would have to account for all other systems needed to support a specific energy source, such as energy storage and the expense of increasing the size of the transmission networks. If a renewable energy source needs to be backed up by burning fossil fuels to assure adequate reliability, as in the case I pointed out for California, then the Social Cost of Carbon plus the operating cost of this fossil fueled backup must also be accounted for. Dan, I do not have such a comprehensive cost comparison, do you? What I have read in NREL publications is that in order for renewable energy systems to become the dominant source of electricity it will require very large increases in the nation’s transmission systems to achieve adequate system reliability. Not only is this expensive, it evokes huge nimby issues that would limit the pace at which renewable energy systems can be deployed. This has already happened in New York state when the so-called “Energy Highway”, a high voltage direct current line, was supposed to bring upstate renewable electricity to the high demand areas in downstate New York. The public resistance to this was so high that the idea seems to be abandoned now. In 2018 New Hampshire blocked a transmission line that was to bring hydro power from Canada to Massachusetts. In Germany, there already are reports of people who, until recently, supported the large renewable energy program, Energiwende, but now oppose it because it would bring transmission lines within sight. One also has to examine the useful life assumptions. the limited data I have seen suggest that wind turbines only have a useful life of around 20-25 years. This is a short time period, but may be appropriate for rotating equipment in a salt air environment. If there were tens of thousands of off-shore wind turbines in 20 years or so, a very large wind turbine replacement capability would have to be put in place. By contrast, nuclear plants in the USA have achieved regulatory approval to operate for 60 years and recently one utility is applying for an 80 year nuclear plant license. Nuclear plants, as constructed in the USA today are far more expensive than they should be. Two major cost reductions, enjoyed by other countries, are standardized designs and assembly line factory construction, as much as possible. The use of standardized designs not only reduces unit costs, it minimizes regulatory risks that plant-to-plant variations can introduce. Some standardized designs are “ready to go” as they have already been approved by the Nuclear Regulatory Commission. The cost of money is another critical cost issue. Several years ago OECD made a comparison of LCOEs for South Korea, China, Japan, and the USA where 5% and 10% discount rates were assumed. For South Korea, at the time of this OECD analysis, and at a 5% discount rate for its APR-1400 design, had an LCOE of $29.05 per megawatt-hour. At a 10% discount rate this APR-1400 South Korean design had an LCOE of $42.09. The USA Gen III + design had an LCOE of $48.73 per megawatt-hour at the 5% discount rate and $77.39 at the 10% discount rate. Two lessons come out of these numbers. At the same discount rate the lower South Korean numbers are largely due to standardized designs and factory construction. The large cost difference between a 5% and a 10% discount rate might be traceable to the role federal governments play in supporting high capital cost projects. In South Korea federal support is high while in the USA federal support has been weak and inconsistent. Costwise, there is a 62% difference in LCOEs between $77.39 to $29.05 LCOEs. USA shipbuilders are suggesting that whole standardized nuclear plants be built in the ship yard and sailed or towed, if barge mounted, up to their site, perhaps 20 miles off shore or within major rivers and the Great Lakes. A very large percentage of Americans live within short distances to these waterways. This arrangement has the potential to radically reduce nuclear power plant costs. Your comments do not dispute my contention that nuclear costs more and takes longer to deploy, therefore, from a climate point of view we should put most of our resources into deploying renewable energy. Yes, renewables have issues, though a 20-year life for turbines won’t be much of an issue because the replacement costs will be far lower than today’s costs. If you want to bring up issues with renewables, we should also look at the issues with nuclear such as the waste problem, the abandonment problem, NIMBY, etc. With climate change bringing future massive storms never seen before (“Storms of my Grandchildren”), I’m not sure that ship-based nuclear plants are the best way to go. And in any case, you are suggesting ways that nuclear can be more cost-effective, but we are not there yet. Let’s reevaluate nuclear when that progress has been made and lets deploy massive amounts of renewables in the meantime! There is a very wide misconception about the potential dangers of nuclear power. The data make it absolutely clear that nuclear is by far the safest, in terms of lives lost per kWh generated, of all the major sources of electricity. Hydro is far worse because dams break and flood towns. And coal is clearly the most lethal. However we should be spending considerably more than we do to carry out the R&D to achieve a safe, sustainable method to recycle the nuclear waste. A viable recycling method would solve the storage problem by reducing the volume by more than an order of magnitude and the requisite time from many thousands to a few hundred years. Moreover recycling would enable us to get over 90% of the energy potentially available in the uranium fuel, instead of the 5% we get now. While this may not be the case outside of the US, public perception of nuclear risk is simply not an issue or a barrier to nuclear deployment. All one needs to do is to go to Gallup and look at all of the surveys of public perception since prior to Three Mile Island. There was a brief period after TMI where it dropped below 50 %, and of course Fukushima caused a drop as well, but now it is back to 50/50 for or against. Nuclear has not been in serious consideration for quite some time because it competes in a deregulated market – it is not cost effective relative to its competitors, and increasingly so. It has no buyers – and this absence of buyers has almost nothing to do with public perception of risk. It has everything to do with public perception of cost. The bottom line is that in order for nuclear to be included in a future energy portfolio, the public needs to be willing to pay a premium for it over its alternatives. I agree with Dan Miller and others that nuclear has serious cost problems. However, I am not sure that I agree with Gerry Runte that public perceptions of safety do not pose a barrier. The problem is that negative perceptions of nuclear safety are concentrated in the progressive sector of the political spectrum, which is also the most fervent in its support of climate action. Without the progressives on board, no climate action. With them, no nuclear. The issue of greatly expanding nuclear power deployment in the United States and other countries to reduce greenhouse gas emissions is a conundrum that has not been resolved. As I have argued previously on OurEnergyPolicy.org, the key to resolving this issue is reducing the costs of new nuclear power plants and demonstrating to policymakers and the public that the newly deployed plants would be economical and safe. The U.S. nuclear industry needs to decide on a standardized design for future nuclear power plants that will be most cost-effective to deploy on a large scale in the United States and for export to other countries. Nuclear power proponents continue to support nuclear start-up companies proposing various possible designs, but this approach defeats the purpose of streamlining the process for government approval and replicating production to deliver substantial economies of scale in mass deployment. After the nuclear industry decides on the best design for the next generation of nuclear reactors, a major pilot project of this standardized new reactor should be fully assessed by a panel of objective, trusted experts. Otherwise nuclear industry proponents and public policymakers will continue to argue back and forth about the issues without making any progress, and the general public will continue to be mistrusting and fearful of new nuclear plants being built. Some nuclear power proponents claim such testing of new nuclear power designs have already been done, but I do not believe there is any clear understanding by policymakers, analysts, and the general public that nuclear power has overcome cost and environmental objections. The pilot project should carefully assess the capital costs of building the nuclear power plant, the operating costs of the plant, the total cost to consumers per kWh of electricity delivered, the greenhouse gas emissions associated with the life cycle of the plant, the nuclear waste storage requirements, and the general safety of the plant. This pilot project should also extrapolate the costs of deploying such plants if mass production ensued. The results and comparison to alternative sources of electric power should be clearly communicated to policymakers and the general public. If the pilot nuclear power project successfully demonstrates that it generates cost-effective, clean, safe electric power, that would be the best way to convince governments to streamline the licensing process for similar nuclear power plants to be built on a commercial basis either as replacements for existing nuclear plants or as greenfield facilities. Nuclear power is a critical option to consider in heading the world towards zero net greenhouse gas emissions and halting global warming. Electrical power demand will soar with the transition to electric vehicles and electrification in residential/commercial/industrial sectors to replace fossil fuels. Nuclear power may be a cost-effective option combined with renewable energy and storage to meet the huge global demand for electric power. But to commit to massive nuclear power deployment, policymakers and the public must have confidence that it will be an economic and safe approach. I believe that standardized design and pilot project demonstration/extrapolation are the way to work the energy policy community out of the current conundrum. This direction should be decided on soon by the federal government and nuclear industry so that nuclear power has the potential to contribute substantially to addressing the global warming crisis. Safety is only a small part of why nuclear won’t work for the future. I agree with much that Dan has written but I would like to put a few other issues into the mix …. Much of the info comes from Tom Hadwin, a retired utility executive who has been writing to change the rules under which Virginia’s utilities operate … and challenging Dominion Power’s IRP. First … getting the numbers right. Here in VA Dominion has greatly exaggerated the projected demand numbers, not giving any credence to what a commitment to building efficiency and onsite generation can produce. Overbuilding is the utility wanted result because generation assets produce profits in a rate-based regulation. Third … “Nuclear units are ‘must run’ facilities and very inflexible in their operation. They are a bad fit for the rapid response, variable operation needed from the modern grid. First gas and very soon, storage will smooth the intermittent issue of solar and wind on the grid. Lastly – extending the life of nuclear units … Here in VA, Dominion has 4 operating nuclear units that have each extended their 40- year operating life with licenses to 60 years. Dominion has filed for one, and plans to file for the other reactors, to extend their life to 80 years, an unprecedented extension. No US unit has operated for that amount of time. Upgrading the units to meet a life that is double their originally designated life is a risk of their operating parts. In addition, the nuclear units will not be able to compete financially, given what it will cost to refurbish them for their extended use. I don’t think that we will be able to safely scale the nuclear industry to make a significant dent in the mitigation of the impending climate crisis. Acknowledging the cost and waste issues, my principal concern is the almost complete absence of a robust design and construction engineering and experienced operations management infrastructure to build and operate the huge number of plants necessary to make the kind of difference advocates forecast. We would have needed to make the commitment to nuclear 20 years ago in order to have that knowledge and experience base. We simply cannot afford to have nuclear plants designed, built and operated by inexperienced people. We could and should develop and test some of the emerging nuclear technologies that might perform a ‘firming’ role in the grid of the future, but I don’t see this technology being much more of a “battery” supporting the network of microgrids that will replace the current centralized grid. This comment might have been plausible a year or two ago, but it is no longer so. There has been a convergence of forces that is causing a major shift in the acceptance of nuclear power in the United States. First, there is the grim news that we are falling behind in dealing with climate change with GHG release rates actually increasing in 2018. People around the world are frightened by the huge volumes of ice falling into the ocean near Antarctica. Deadly fires in California, hurricane Harvey,polar vortexes, flooding from record breaking rainfalls, etc., have heightened awareness around the world to this existential threat, and people are responding. Second, we now know that when nuclear power plants are closed they are not replaced by renewable energy; they are replaced by fossil fuels, principally gas. Third, some of the world’s largest renewable energy programs are not meeting their stated goals. This includes Germany’s Energiewende effort. In California, gas plants are releasing GHG as they continuously run on a stand by basis to rapidly compensate for the variability of renewable energy. In the evening these gas plants ramp up as the sun goes down. New York is having its problems too. If the Indian Point nuclear plants are closed, they will be replaced by gas, contrary to the Governor’s commitment to only use emissions-free sources. If gas replaces Indian Point, in just two years the huge volume of released GHG will wipe out the cumulative environmental gains that New York has made since 2003 in its highly touted REV program. These forces are causing political changes. 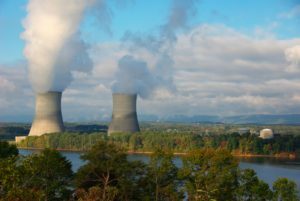 On a State level, New York, New Jersey, Connecticut, and Illinois have taken financial support steps to prevent the premature retirement of many of their nuclear plants. Similar actions are being considered in Pennsylvania, Arizona, Ohio and elsewhere. Environmental groups that once opposed nuclear power have reconsidered their positions. This includes the Union of Concerned Scientists ( See “The Nuclear Power Dilemma”, S.Clemmer, et al) and the Environmental Defense Fund ( See “Why we Still Need America’s Nuclear Power Plants-at Least for Now”, J. Finnigan). There are a number of newspaper articles that illustrate this rapid shift towards greater acceptance of nuclear power. Perhaps the one most relevant to your statement appeared in the Washington Examiner on March 31, 2019 “Threat of Climate Change Pushes 2020 Democrats to Embrace Nuclear”. Add to this the Wall Street Journal’s ” The Climate needs Nuclear Power” published on April 5, 2019 and the NY Times opinion piece ” Nuclear Power Can Save the World”, published on April 6, 2019. Many of us have to reconsider our positions on climate change. One can hope that some climate change deniers will accept the conclusions reached by an overwhelming percentage of world scientists, not to mention just observing the extreme weather events we have already been subjected to. One can hope that extreme nuclear advocates come to realize that nuclear + renewable energy + a strong dose of conservation is superior to nuclear power alone. My research shows that there are many attractive nuclear/renewable combinations that have hardly been explored.One may hope that groups that want existing nuclear plants to continue to operate, like the UCS and EDF, will further evolve into wanting new nuclear plants built. As for the readers of this discussion paper, and I hope yourself, I urge them to use the link that will bring them to the report “Become a Nuclear Safety Expert”. There you may learn that nuclear power is far more benign than generally recognized. Even if there were a rare core melt accident, the expectation is that there would not be any near term radiologically caused fatalities or radiation sicknesses and long term health effects, if any, would be too small to be detectable. Further, achieving such very limited radiological health effects only requires a strong containment building in which natural forces, like gravity, would reduce airborne radioactive material in the containment to very low levels before significant containment leakage began. Nuclear wastes and costs will be discussed in a separate response. 1. Nuclear is expensive and takes a long time to deploy. A. ” China and South Korea can build reactors at one-sixth the current cost in the United States.” See “Nuclear Power Can Save the World”, NY Times, April 5, 2019. C. Small modular reactors are under development that address economic concerns. I believe that the Tennessee Valley Authority plans to build the first such reactor and has already submitted an application to the NRC. See ” 3 ways Small modular Reactors Overcome Existing Barriers to Nuclear”, Scientific American, May 19, 2016. D. I think your economic arguments are illogical and inconsistent with what is really happening. Since we are in a race against time to reduce GHG releases, would not renewable + nuclear reduce GHG releases more rapidly than either one alone? In order for your argument to make any sense you would have to prove that that investing money in a nuclear project deprived money from renewables. Where are the data to support your argument? New York State has subsidized four upstate nuclear plants while simultaneously supporting its renewable energy, conservation, energy storage, and electric vehicles programs. I have not seen any evidence that supporting nuclear slowed down any of these other programs. Economically, what is really going on is that the low cost of fracked gas makes nuclear plants non-competitive in certain markets. When nuclear plants close they are replaced y fossil fuels, not renewable energy. When this happens the environment, including you and me, are losers. At the very least you should support keeping existing nuclear plants operating. D.As to placing nuclear power plants on ships, Russia has already done this to supply electricity to their remote oil fields.Decades ago Westinghouse designed barge mounted nuclear power plants. Nuclear power is on navy ships around the world, which is far more complicated than barge mounted reactors. Nuclear power on ships is proven technology. 2.Nuclear plants are dangerous if not decommissioned properly. I believe your logic is also backwards on this issue. I suggest you read ” The Long Emergency” by James Kunstler and you will get a better idea of how dangerous and difficult the world would become without a capable and functioning government. Abandoned nuclear plants would rank as a very low risk in such a scenario, compared to marauding weaponized mobs searching for food, water, and shelter. Logically one should make every effort to prevent this from happening. Having sufficient energy is essential, including nuclear power, along with renewables and conservation. We are not as far apart as it might appear. When it comes to the choice between fossil fuels and nuclear, I chose nuclear. I don’t think we should close down existing nuclear power plants. I hope the developments you speak about (lower cost, faster development, SMR) come to pass and can be considered. I understand that they may be true in other countries and not yet in the US. Since the US has been ignoring the problem of climate change, we need to make choices based on the current situation (for now). For now, renewables are cheaper and faster to deploy than nuclear, so a given amount of money spent on renewables will reduce emissions more and faster than the same money spent on nuclear. We have not reached the point where the amount of renewables are destabilizing the grid. When that occurs we can consider nuclear, geo-thermal, CSP, dispatchable renewables, storage, and other “baseload” technologies. I suspect that storage (both daily and seasonal) will be quite cost effective in a decade… it is replacing natural gas peaker plants today. I agree that we need to do everything possible to avoid the collapse of civilization. I and others have been saying so for over a decade and the world has done very little in that time to address climate change (and the other global problems that can lead to collapse). So while I agree with you that we need to do everything possible to avoid collapse, that doesn’t mean we should not take collapse into account when we make energy choices. Some energy technologies can fail safely and others do not. Nuclear is not the only choice for carbon-free baseload power. We should promote R&D of nuclear and other technologies so we can make the best choices as we go forward. I’m pleased that you think that we are not as far apart as it might appear. We both agree that climate change represents an existential threat. We agree that fear of nuclear power is irrational and that nuclear power is a better choice than using fossil fuels. We also agree that existing nuclear power plants should continue to operate. We agree that some form of a carbon tax is a crucial step towards a low carbon future. We agree that we must prevent climate change from causing a collapse of society and the rule of law. While we did not explore the nuclear waste issue, I believe that we would agree that the risks from nuclear wastes are insignificant, as are the risks from solar panel wastes that contain toxic materials like lead and cadmium. Such minor risks are manageable and tiny compared to the releases of GHG into the atmosphere or the toxic materials in coal ash dumps that are placed near our waterways, with a history of massive failures and likely to happen more frequently during the extreme rainfalls and floods that climate change brings us. Toxic materials, like lead, are stable which means that they have an infinite half life. If one is concerned about the long half life of some nuclear wastes, they should worry about abandoned lead mines around the country. However, we have serious disagreements about the future role of nuclear power and how to proceed to reduce GHG releases as rapidly as possible. We are in a race against time to reduce GHG releases. You have not addressed my statement that nuclear + renewable would reduce GHG releases more rapidly than either one alone. You have not supported your claim that investing in nuclear power diminishes investments in renewable energy. Further, my own research has shown that there are many opportunities to use combinations of nuclear power and renewables that are superior to using either technology alone. These opportunities would be lost in an all renewable future, assuming that is even possible. I do not subscribe to your notion that we can wait on building new nuclear plants until such time that renewables are destabilizing the grid [We may already be at that point in California with its highly inefficient and disruptive “Duck Curve”, which is projected to worsen as California continues to overbuild its solar capacity.) Your nuclear delay notion is inconsistent with everything you have said about the urgency to seriously address climate change. We need bold ideas, not retrenchment. For example, South Korea has created jobs here in the USA by building and selling cars. Why not invite South Korea into a joint USA/South Korea venture to build a nuclear power plant assembly factory here in the States, creating more jobs while benefiting from their expertise of manufacturing standardized plants similar to advanced Westinghouse designs? Part of this package would be a fixed price and set delivery schedule for these nuclear plants, guaranteed by South Korea. The DOE has a role here too of making investment money available at low interest rates ( See my OECD data in another comment) and lining up firm orders from a number of utilities. Perhaps 20 new orders would be a good start. Finally, I am not convinced that your claim that renewables are cheaper and faster to deploy than nuclear represents a comprehensive analysis. On a short time scale, your statement is true for a small number of megawatts. However, over a longer period of time and a large number of installed megawatts the much larger sizes and much higher capacity factors of nuclear plants would likely put more megawatt-hours on the grid than, say, trying to install many thousands of wind turbines. The key here is megawatt-hours, not megawatts, because megawatt-hours is what displaces fossil fuels and reduces GHG releases. To continue, I will just focus on wind turbines because the megawatt-hours from solar PV systems have actually grown very slowly, only 1.5% of the USA electricity in 2018. In NY State, renewable energy has been supported since Governor Pataki was in office and last year it only produced enough electricity to meet the State’s needs for three hours and twelve minutes. In NY State it has taken 15 years (2003 to 2018) to install about 800 wind turbines at an average size of 2.3 megawatts. In 2018 these 800 or so wind turbines produced about 3% of the State’s electricity, while 6 nuclear plants produced 10 times more. This is partly due to the low capacity factors for land based wind turbines in NY, about 26%. The nuclear plants’ capacity factors are close to 90%, with the Indian Point nuclear plants exceeding 93%, average over the last ten years. It would take 1,555 wind turbines, each at 2.3 megawatts with a 26% capacity factor, to replace a single 1000 MW nuclear plant with a 93% capacity factor. If the percentage of energy from renewable energy increases and that from fossil fuel sources decreases, as you and I wish, it will not be possible for renewable energy to continue to use the grid as a huge storage battery. This is already recognized and large increases in energy storage will be needed, but this may be more difficult than what many assume. See ” The $2.5 trillion reason why we can’t rely on batteries to clean up the grid”, James Temple, Technology Review, July 27,2018. Energy storage is inherently solved in nuclear plants because it is accomplished in the uranium fuel itself. A single refueling of a nuclear plant provides enough stored energy to run the plant for 18 to 24 months. No battery system comes close to this. The pace at which land based wind turbines might be added to the grid may be determined by public acceptance of all the transmission systems needed to carry wind farm electricity to the main transmission corridors. Until you define all the assumptions you have made in your claim about renewables being faster and less costly than nuclear, it is difficult to agree that present short term conditions can be extrapolated to longer time periods and larger megawatt-hour outputs. Finally, even if your claim were correct in the long term, all renewables would still reduce GHG releases more slowly than renewables + nuclear.